Here are the recent gasoline prices in selected ASEAN economies, in US$ per liter. Domestic prices are affected by (a) exchange rate with the US$, (b) local subsidies or taxes, (c) local production if any, (d) other factors. Data is from https://tradingeconomics.com/country-list/gasoline-prices. 1. Indonesia. I think they still retain the oil price subsidy until today although at a lower rate than before. While expensive oil is bad,f subsidized oil can also be bad because people would use more than necessary. Thus, instead of having only one car for the family, get two. 2. Malaysia. Also has oil price subsidy but not as high as those in Indonesia. 3. Vietnam. Perhaps they do not have oil subsidy, and neither distorting the price upwards via oil taxes? 4. Philippines. Distorted oil prices via TRAIN law, part 1 implemented in January 2018, part 2 in January 2019, and part 3 in January 2020. Diesel tax was zero until 2017, P2.50/liter in 2018, P4.50 this year, and P6.00 next year. 5. Thailand. Perhaps no oil subsidy too. * This is my article in BusinessWorld on April 8, 2019. The good news in Philippine inflation is that the numbers are declining in the past three months of 2019. The bad news is that even such “low inflation” is actually the highest in East Asia, among the more mature economies with updated numbers. Dutertenomics should be ashamed of this. And even in the Bangko Sentral ng Pilipinas (BSP) quarterly Business Confidence Survey, the trend is a continuing decline from 46.8 in 2015 to 34.0 in 2018. 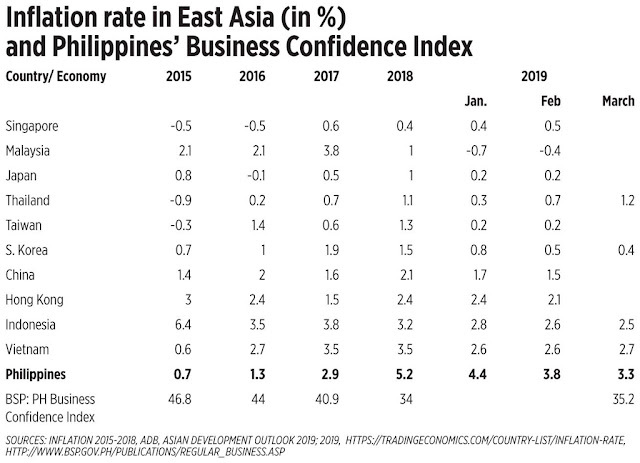 Again, Dutertenomics should be ashamed of this continuing erosion of business confidence in the country (see table). Meanwhile, we see President Duterte doing U-turns in major policies. First, his centerpiece program drug war, the kill-kill-kill policy, has resulted in some 25,000 murders but recently he admitted that he cannot control illegal drugs in his term. Second, the shift from integrated PPP to hybrid PPP just to favor China contractors and financing — the need for more taxes to pay for more loans when many infrastructure projects can be financed entirely by private contractors under integrated PPP. Among the casualties of this shift is the delayed construction of Kaliwa Dam and additional 600 million liters per day for Metro Manila. Third, his avowed fight against corruption is contradicted by the release from jail of two former senators linked to plunder, Sen. Bong Revilla and Jinggoy Estrada, who are each seeking a fresh term under the Hugpong/Duterte slate. And fourth, his economic team’s avowed promise of economic stability is contradicted by deterioration in macro fundamentals. GDP growth is decelerating, 6.9% in 2016, 6.7% in 2017, and 6.3% in 2018. 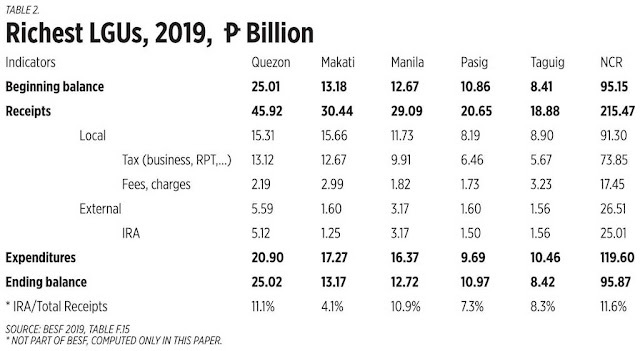 Inflation rate worsened ever since TRAIN law was implemented in 2018 with its high oil-coal tax hikes among other tax hikes, and business confidence index continues to decline. The Duterte government’s economic management is poor while its political bragging is high. It has a chance to reverse this by at least targeting a 1-2% inflation rate this midterm election year via suspension of oil tax hikes part 2, or a tax cut somewhere. Instead, it continued its economic and political arrogance by expanding the spend-spend-spend, tax-tax-tax, borrow-borrow-borrow mantra. I hope that voters will take note of these and punish the Duterte senatorial lineup, as well as their congressional and local government candidates. Another good article from Nick Smith, Chairman of Lion Rock Institute, the only free market think tank in Hong Kong. Reposting in full, enjoy. Why am I writing about planning? Central planning of a country, or indeed a city, should have been completely discredited by the Soviet “experiment” 100 years ago. One might have expected that the breakup of the Soviet Union in 1989 would have marked the last we would hear of central planning. Yet so called “liberal” economies move further and further towards planned economies today, with regulations and legislation controlling more and more economic activity. Why? My guess is that the obvious need for each of us to plan our days to meet objectives, and for each enterprise to do the same, tempts the belief that what makes sense for an individual or company must also make sense for the entire community. Most citizens not only accept that the City should plan, but that it must plan. In other words, the Government is expected to plan. It must have an IT plan, a plan for youth, a plan for the elderly, a plan for everything. But this makes no sense. Central plans don’t work for two main reasons. First, no Government can have enough currently applicable information to implement any plan effectively. (Moreover plans tend to be fixed while the world constantly changes.) Second, and more important, there is no single plan that can satisfy the myriad of different preferences and desires of the population. Laissez faire economies work because each of us can make our own decisions; about what to eat, where to live, what to read, who to befriend, etc. The outcome of millions of these daily decisions is not planned and cannot be planned. We each have our own plan based on our own knowledge of our needs and desires, as they change every day. The city of “Hong Kong” is not a single entity. It is simply the aggregated outcome of what all of us living here decide to do every day. Yet so much debate of public policy seems to assume that a single “policy” can be discovered that represents what “Hong Kong” wants/needs. The administration continually searches for “public consensus” on such policies and seems surprised that it is so hard to build such a consensus. But with a population of 7 million people, this is a fool’s errand. There will never ever be a consensus on anything interventionist or coercive. This means if the social structure of Government is based on imposing single monolithic “policies” on all, there will always be division and discontent. The only avenue that leads away from such a divided society is a free economy where each of us pursues his own preferences (as long as we don’t impose on our choices on others). Yet we have an administration that believes its mandate is to find solutions for all of “us”, instead of allowing citizens to find their own solutions. There one consensus that is possible. A laissez faire consensus that Government’s role is to defend citizens against coercive acts of others. That is, to provide for policing and the courts. It seems to me that when most citizens say how important the rule of law is, they are reflecting an underlying consensus of this type. But this is in effect a consensus that no one should coerce others. In complete contrast, Government today (globally, not only in Hong Kong) seems to involve a whole range of coercive acts where some members of the population are forced to accept a policy they dislike because the Government wants to implement its “Plan”. Let’s look at a couple of examples to see where this approach leads. Education systems across the world demonstrate how consensus can never be achieved. Rather than restraining Government invention to redistributive taxation, to provide poorer citizens the means to buy education in the private sector, most governments operate the educational institutions themselves. This results in a monopolistic sector with the usual consequences of monopolies; poor service and high cost. It is ironic that all Governments rail against any monopoly in the private sector. Yet inside the public sector, the perils of monopolies are ignored. But beyond the inefficiencies of this, the lack of choice that results is perhaps even more insidious and damaging to public contentment. Think of the constant debate in the media about curricula issues; national education and liberal studies to name only two. Because the school system is state owned and monolithic, all kids will receive the same form of teaching and curriculum. Some parents and children may like it, some may not. But the latter group cannot vote with their feet and move to another school that teaches differently. All they can do is to move into the sphere of “politics” to seek ways to change Government “policy” on these matters. Those who lament how politics everywhere are always so aggressive and confrontational miss the point. Since the aim is to win power and force others to accept something they dislike, of course it will be confrontational. Politics is confrontation. Yet if the provision of education was left to the private sector, many different types of learning arrangements and content would be offered, precisely because there are differing demands. Parents could make their own choices and the supply side would adapt to this. No one would think of the Government deciding we should all eat pork and never chicken. No one would accept a Government “policy” for every dinner menu. Yet this is what happens in schools. The consequence is a never ending search for consensus where none exists, and endless discontent throughout society. Let me take transport as another example. At first sight this industry appears to be in the private sector. The franchised buses, PLBs, taxis, ferries and even the MTR are run by private companies. But through regulation the Government control almost everything. Fares, routes, type of vehicle, are all subject to Government approval. You might think that bus routes should be decided by public demand, met by competing providers. Yet closing an unprofitable routes is subject to Government approval. The industry is prevented from responding to those countless individual travel “plans” we all might have every day, that I spoke about earlier. Routes are kept going because of “political” pressure even where demand is lacking. 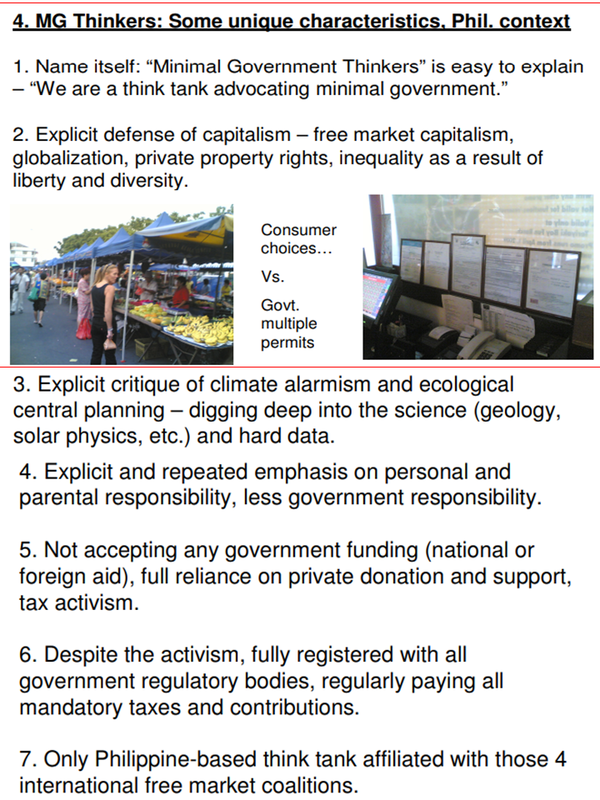 As I noted earlier, the sad aspect of this for me is that citizens themselves do not see the value of the market. A few months ago there were proposals to run ferry services across the harbor between new locations. In the debate some commented that this should not be tried because it may not be wanted. Yet a market economy works precisely because it tests whether there is demand. If there is not, the business will fail. The correspondent writing to the newspaper took the view, however, that the Government should assess whether it thinks there will be demand and if it does not, the service will never even be trialled. In other words the Government should plan, and then implement their plan. The market test should never be tried. Free choice should not be tried. More and more Government planning inevitably means that personal choices will be reduced. Next time you are tempted to demand the Government comes up with a “plan” for this or that, please remember the part of cost will be fewer choices for you as a citizen. Do you really want that? * This is my article in BusinessWorld last April 05, 2019. The ride-hailing, food- and cargo-delivery, other technology-based service sector is a modern and fast-rising one in the Philippines and in Asia. It helps people and companies conduct their travels and businesses become more convenient and safe. The sector should get further Market-Oriented Reforms for Efficiency (MORE) to aid further modernization and competition, which will benefit the public. The Philippines has a good outlook in the ride hailing business based on Statista projections. The compounded annual growth rate (CAGR) in 2019-2023 is estimated at 25% and should be among the highest in the world. Indonesia is the biggest market in the region, followed by Singapore and Thailand (see table). So it was the 60-40 constitutional restriction that prevents the entry of Go-Jec in the Philippines. Other big global players like Lyft might consider coming in too someday and they must also endure the 40% maximum foreign equity restrictions. This is indeed a bad law and constitutional provision that must be corrected and lifted. But while it is still there, we have to live with it. 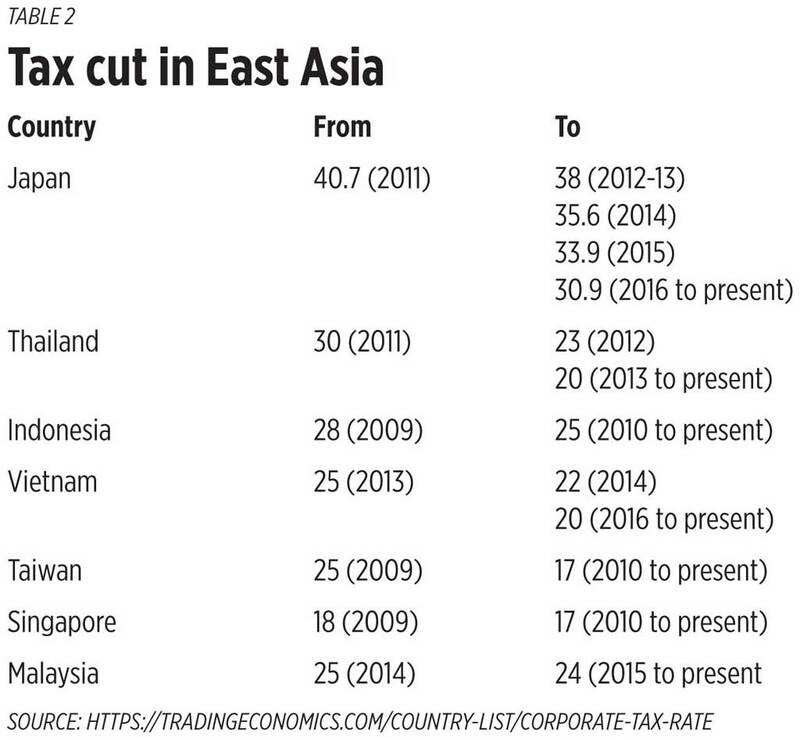 The Philippines’ 30% corporate income tax is a bad and ugly law (vs our neighbors’ 16%-25% rate), the 12% VAT is another bad law, as ours is the highest in East Asia. But we have to live with them until these laws are revised and the tax rates are adjusted downwards and we can join the tax competition in the region. That is how the rule of law works. We should have more ride-hailing competition in the country, we should attract the big global players as the sector is highly technology- and capital-intensive. These will benefit the public as they will have more choices. But players and the public must respect existing laws then work to amend and liberalize them soon. 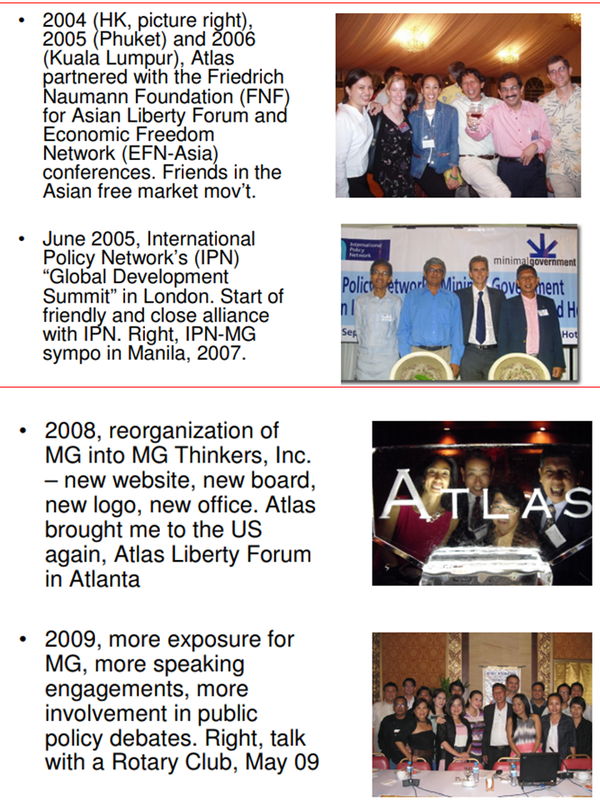 I dug an old presentation in 2009 in one of the Atlas events. Well, it was the last Atlas event where they gave me a travel grant. 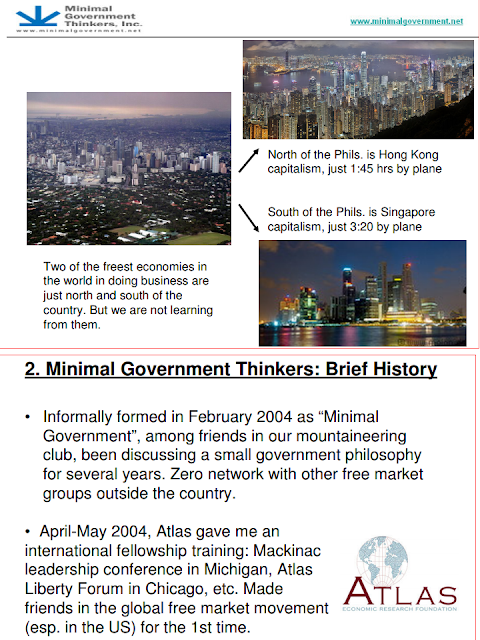 Here are portions of that 28-slides ppt. I thanked Jo Kwong, then Atlas VP for Institute Relations, for finding resources to make me participate in that conference. Jo resigned from Atlas in 2010, and Atlas gave me zero travel grant since that year until today. Oh well, no problem. * This is my article in BusinessWorld last April 3, 2019. In a September 2017 paper, “Implementing the 10-point Socio-Economic Agenda,” the Arangkada Philippines Project (TAPP) made 22 recommendations for the power sector, among which are: (1) Support and approve the massive energy investments, (2) Increase the system reserve requirement to 25% of peak demand vs the current 17%, and (3) Formulate an energy road map (generation portfolio mix) with power supply quality, reliability and affordability as key objectives. These are good recommendations to expand and ensure more stable power supply, more competition among more players, more consumer choices, and cheaper energy prices. 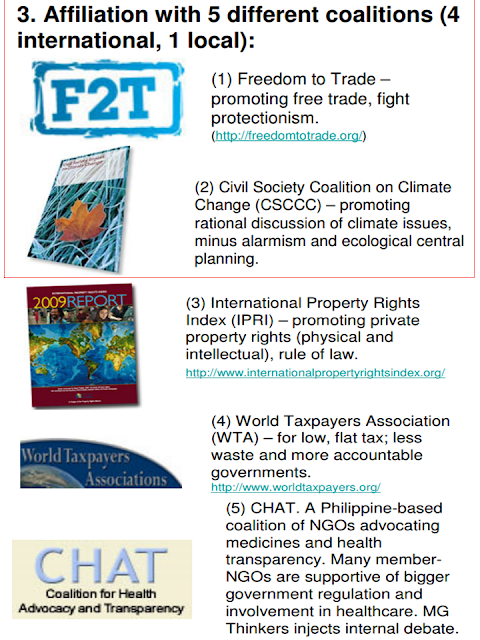 Which are the main advocacies of the Market-Oriented Reforms for Efficiency (MORE) series in this column. It is not possible to have sustained fast growth if there is no reliable, stable, 24/7 electricity in major economic centers if not nationwide. 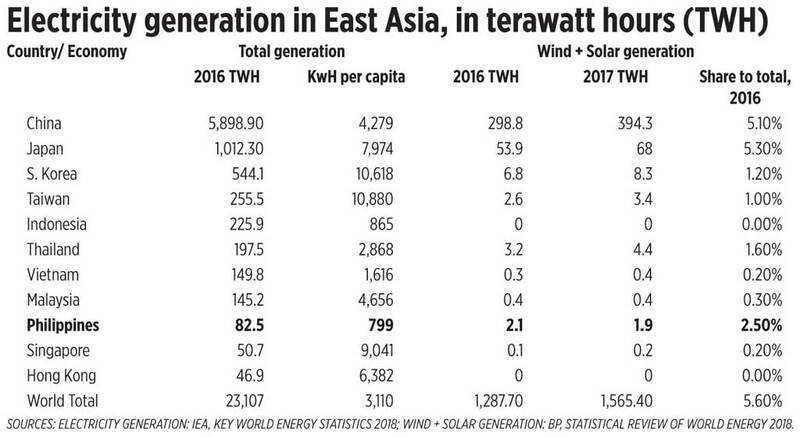 And the Philippines remains among the laggards in East Asia in terms of total electricity generation and kWh per capita. Then there is the persistent promotion plus subsidies to variable renewables solar and wind starting with the RE law of 2008 (RA 9513) but after 9 years, their combined output remains very small (see table). The good news is that the Energy Virtual One Stop Shop (EVOSS) law has been signed as RA 11234 on March 8. This will hasten approval and permitting system in power construction and development. While the Philippines is still far from having wind + solar oversupply, strong legislative and executive lobbying point to that direction. The interest of electricity consumers — more stable electricity at cheaper/competitive price, no additional taxes and subsidies like the feed in tariff (FIT) allowance — should prevail over government, as well as the RE lobby and environmental NGO interests that oppose fossil fuel power plants which can provide stable, cheaper power. Last Tuesday, April 2, I participated in a roundtable on "Challenges Facing the Philippine Power Sector" organized by The Arangkada Philippines Project (TAPP) and the US Chamber of Commerce, at Amcham office, Makati. Participants were from Amcham, Quezon Power, Aboitiz Power, Alternergy, GE, PIPPA, IEMOP, ECCP, GPDP, NGCP, DREAM, MBC, MAP, PCCI, PCFR, PSPA, PhilExport, USAID, etc. Meanwhile, one way to reduce power rates is to remove tariffs, non tariff barriers (NTBs) for both renewable and conventional power systems. Currently what we have are lots of taxes, tariffs, NTBs for conventional and few taxes, even subsidies for renewables. RA 9513 or the RE law of 2008, Section on fiscal incentives, lots of these and there were already legislated, 11 years ago. In contrast, no such fiscal incentives for conventionals. Leandro Leviste, son of Sen Legarda, is a special kind of entitlement thinker, that even many or all other RE developers hate him and his Solar sa Bayan franchise bill. Could become a law by May or June. PH has low electricity production nationwide. Even if we double our electricity output say 15 years from now or in 2034, that level would perhaps be what Vietnam produced this year or last year. Or that PH output in 2034 would be what Thailand produced in around 2010 or a decade ago. Many people demonize the so called "big" power companies and players. But without them, our electricity output maybe on the same level as Cambodia or Myanmar. Of the roughly P10/kwh bill, only about P5.50 (+/- P1) is generation cost. The other 4.50/kwh? Transmission charge, distribution charge, supply charge, universal charge, metering charge, system loss charge, FIT allowance for RE, VAT, other taxes. Here's an example, power rates collected by Meralco as of March 2019. On the Supreme Court TRO vs RCOA since February 2017 that remains indefinite -- SC legality can be ignorant on many economic issues like energy pricing and supply contracting. Without that SC TRO, we may be in the 500 kw level already and by two years more, perhaps down to household level. * This is my column in BusinessWorld on April 01, 2019. The official campaign period for local and Congressional candidates for the May 2019 started last Friday, March 29. Tens of thousands of candidates plus their supporters went out on the streets and reached out to media to get the support of the undecided. Also last Friday, I attended the “Benchmarking Cities: A roundtable discussion on infrastructure” sponsored by KPMG Manila, the speaker was Richard Threfall, the global head of KPMG Infrastructure. While Manila is not part of their initial coverage of cities in their report, a lot of the issues covered have relevance to the metropolis. Local government responsibility and irresponsibility is the topic of this column’s Market-Oriented Reforms for Efficiency (MORE) series. 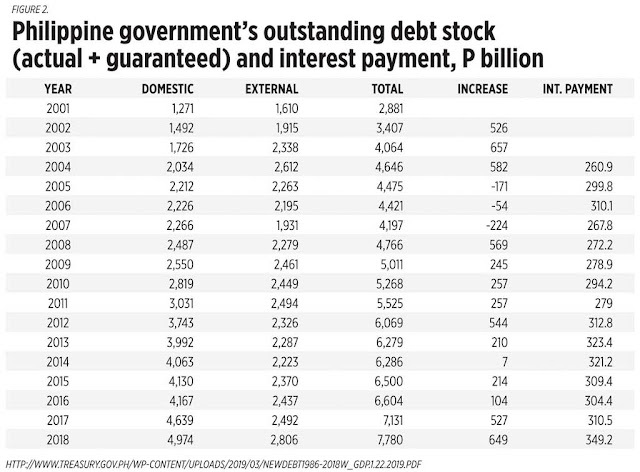 Last Friday this column discussed about fiscal irresponsibility of the national government as it keeps borrowing even without economic turmoil or crisis and the public debt stock keeps rising, already at P7.78 trillion as of end-2018 and interest payment alone at P349 billion that year. 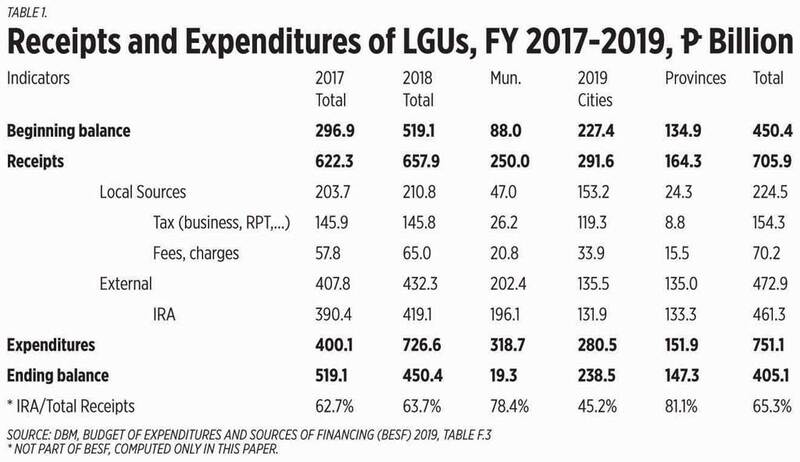 One reason for that is the frequent free-riding attitude of most local government unit (LGU) leaders and congressional legislators. Many local projects are created and expanded without using local resources and rely on national funding. 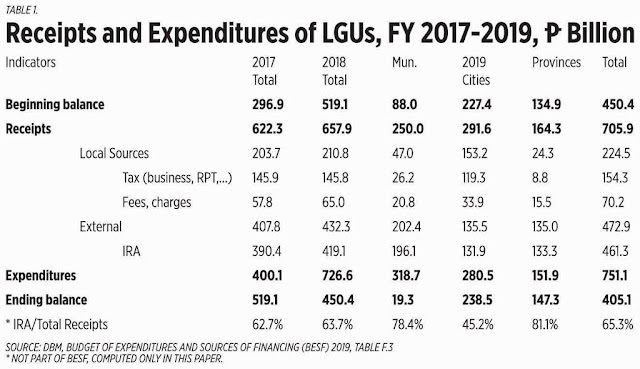 The result is having the national government in perennial budget deficit while LGUs have fiscal surplus, shown in their positive ending balance. Also many LGUs are still heavily reliant on their share of internal revenue allotment (IRA) from the central government (table 1). 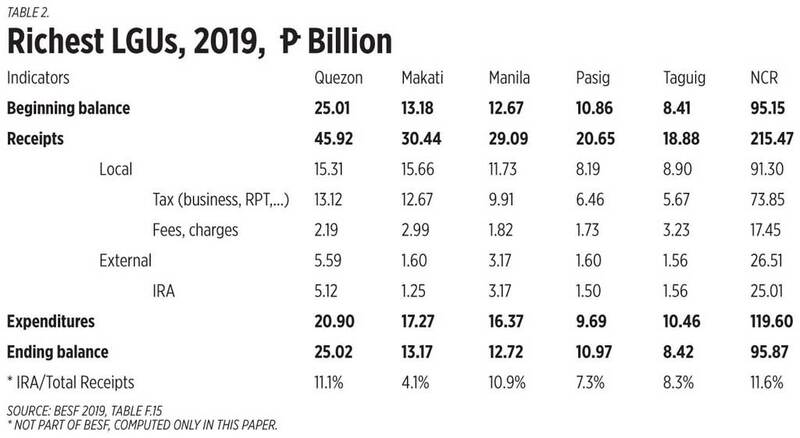 Many LGUs in Metro Manila do not follow this high IRA dependence, they rely more on local taxation, especially on business registration and real property tax (RPT), plus various regulatory fees and charges (table 2). While low IRA dependence by these rich LGUs is commendable, it has also unleashed an itch for more taxation mentality at the local level. Many residents of Metro Manila are pampered with local government welfarism (free healthcare, free movies for senior citizens, protected squatter housing, etc.) which further attracts rural migration to the metropolis. Both national and local governments should learn to respect the people’s right to keep more of their income and savings as a sign of fiscal responsibility. They should realize that the tax-tax-tax mentality for whatever populist agenda is a sign of public irresponsibility. Yesterday, our plane flying Manila to Cebu left the terminal 8.35am on time. Then we were stuck at the tarmac for about 1 hour and 5 minutes before we got the go signal to fly, the usual airport congestion. It's boring inside the plane, the pilots and crew too should be bored while the airline spends huge volume of gasoline even if the plane is not flying. Government – via CAAB, MIA, etc -- collects lots. From airlines: landing fee, parking fee, terminal fee, possibly take off fee? From passengers it collects terminal fee, aviation security fee, VAT on plane fare, etc. 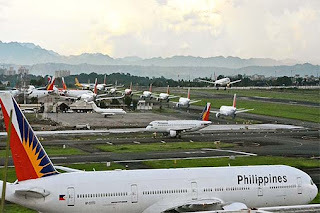 (This photo of long queu of commercial planes waiting for their turn to take off, from abs-cbn news.) Government should compensate airlines for the wasted gasoline, delayed flights and extended working hours of pilots and crew. Compensate also passengers for delayed flights, delayed meetings if any at destination, worse missed connection flights or boat sked. But this seems wishful thinking because the main business of govt is just to collect collect collect. (1) Cecil PB: That happened to my son last March 31 due to air traffic daw at NAIA. The flight bound to Taiwan was delayed and a lot of passengers missed their flight to Houston. They were booked to a hotel by the airline and flew the next day to Tokyo then Houston. He arrived 15 hrs later than the suppose ETA. (2) Gus C: My flight to Cebu was supposed to have left at 08:15. I arrived (with an on-line boarding pass) at the airport at 06:45 for boarding at 07:40 & learned that boarding time was delayed to 08:30 meaning our flight would depart at 09:00. Would you believe that we took off at 11:00. Good thing my first appointment in Cebu was for lunch. I still made it to the venue for a 13:30 late lunch. Coming back to Manila was equally stressful as the turn around plane was not able to take-off from Naia until past 21:00. I eventually got back in Naia at 23:15. (3) Lorenzo G: That is our experience in every domestic flight Noy. 1 hour delayed in every take off, in Manila only, sa provincial airport hindi pumipila sa end of runway ang plane for take off. Too much congested ang NAIA. (4) Bruce H: For the last seven days, my 10am flight to Dipolog was delayed each and every day by at least 50 minutes and sometime 90. However the time scheduled for the flight built in 45 minutes on the ground. I thanked my friends for their observations and sharing of experience. It is frustrating that we directly pay taxes and fees on our plane fare, on top of taxes and fees that airlines indirectly pass on to us. Then we have delayed flight, delayed arrival at meeting or relaxation or connecting flight. And government is not accountable for such costs to the public and private enterprises, monetary or otherwise. * This is my article in BusinessWorld last March 29, 2019. How dangerous or non-dangerous are China loans to the Philippine economy? This is a valid concern but another bigger concern is the endless and irresponsible borrow-borrow-borrow policy of various administrations even without economic turmoil or crisis. This is the subject of the Market-Oriented Reforms for Efficiency (MORE) series of this column today. 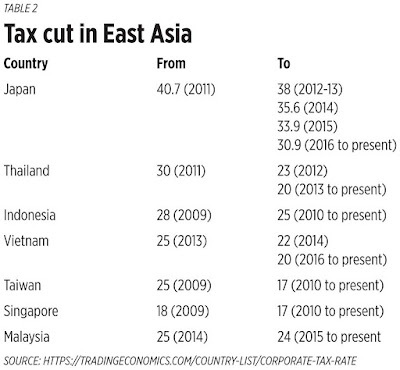 The decline in trend was due to high borrowings by the current administration, even if they have big new tax revenues under the TRAIN law on top of natural increase in taxes. And high public debt means high interest payment. Now the China loans. One example often cited is Sri Lanka, with unpaid debt of $1.1 billion it was forced to lease out to China its strategic Hambantota Port for 99 years. Some 21 projects worth P753.4 billion have been proposed for China funding by the administration, many of which can be done by big local firms at no cost to taxpayers. The Kaliwa Dam Project should be zero loan if the Duterte administration allowed the original Japanese proponent GUDC, or two local firms pre-qualified by the PPP Center, San Miguel and Datem, to build it under integrated PPP financing. But Duterte awarded the contract to China and we have a new loan of P18.7 billion. We need less borrowings. We need to retire more old loans and we should pay low interest payment. There should be more fiscal responsibility in government. Then Peter Wallace of The Wallace Business Forum wrote one of his climate alarmist articles, and he warned "it wouldn’t take much to wipe us out as a race." I wrote to Peter saying that those are ALL false claims, all fake news, all alarmist stories. And he seems to be parroting the alarmism. Their goal is to have more, bigger government, bigger UN, bigger carbon taxes and regulations. All those thick snow and ice from the Arctic to US mainland until few weeks ago were fake? They were 'warm ice'? (1) "CO2 emissions doesn’t seem to bother Trump. Where does he think all that pollution goes?" -- Peter Wallace. He also believes that the gas that he and all humans exhale, the gas that our pets/farm animals/wild animals exhale, the gas that our crops/flowers/trees use to produce their own food via photosynthesis -- CO2 -- is a pollutant gas? If so, he and his friends should consider breathing as few as possible because they exhale a pollutant. (2)"Stop cutting down trees, plant them." Because Peter thinks that CO2 is a bad, pollutant gas and not a useful gas, he is not aware, or does not believe, that more C02 = more trees, more green planet. Little need to use huge taxpayers money for endless tree planting because trees regenerate on their own fast. The "expensive energy (oil, lpg, coal) is beautiful" philosophy under the TRAIN law is partly inspired by climate alarmism. Oil, coal, lpg are fossil fuels that ‘warm the planet’, so government should make them expensive via higher taxes to reduce their use by the people. But see the result – expensive lpg forces many poor households to shift back to using firewood and charcoal, and this results in more cutting of trees in public forest land. Cheap LPG actually helps conserve the forest because demand for charcoal and firewood declines. Firewood gatherers have little incentives to cut down many trees illegally because demand for firewood/charcoal is low and the price is low. Flooding also happens in parts of Baguio city that is more than 4,000 feet asl. Flooding happens in many cities, coastal or mountainous, esp when natural water catchments, low lying areas, were colonized by new houses, buildings, covered with soil then structures are put up. 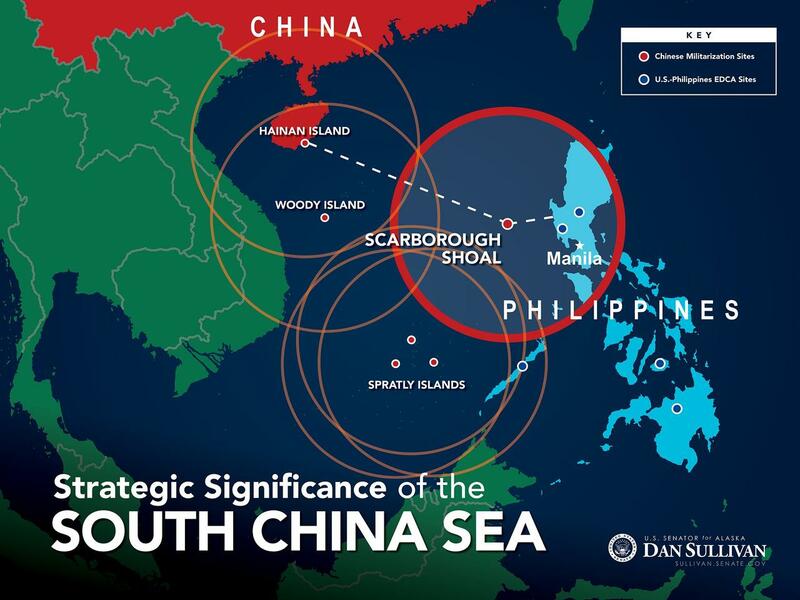 Zero relations with 'rising sea level." 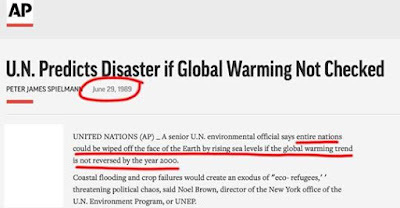 Meanwhile the UN guys are untruthful, until now, of "nations covered by rising sea level" stories, dishonest of their claims of "unprecedented global warming" (no precedent? 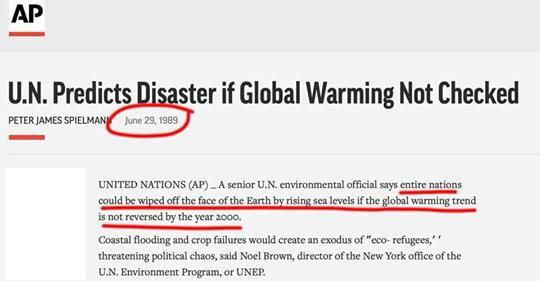 joke), "unequivocal global warming" (no global cooling to happen? joke). * This is my article in BusinessWorld last Tuesday, March 26. The Market-Oriented Reforms for Efficiency (MORE) series continues and tackles the air transportation sector. For an archipelago of more than 7,500 islands and about 20 are big islands with big populations, and air travel is necessary to hasten the movement of people and goods. 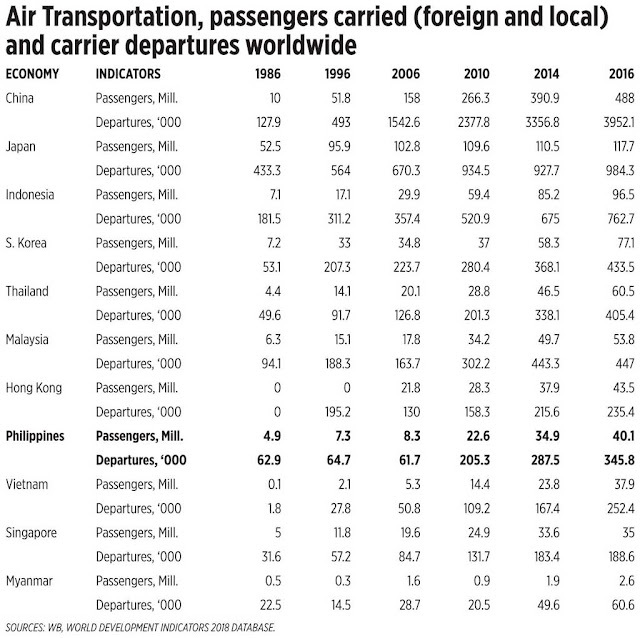 For the Philippines, the good news is that from mere trickles of less than nine million local and foreign passengers transported in the past four decades (1986, 1996, 2006 data), things have significantly improved starting 2010 (global recovery from financial turmoil of 2008-09, then change of administration from Gloria Arroyo to Benigno Aquino III). That year, passengers jumped to 22.6 million, then 35 million in 2014 and 40 million in 2016. The bad news is that compared to our neighbors in East Asia, we are not dynamic and liberal enough to allow more airline competitors, and/or we do not have more big airports, including budget terminals, to fly more passengers. 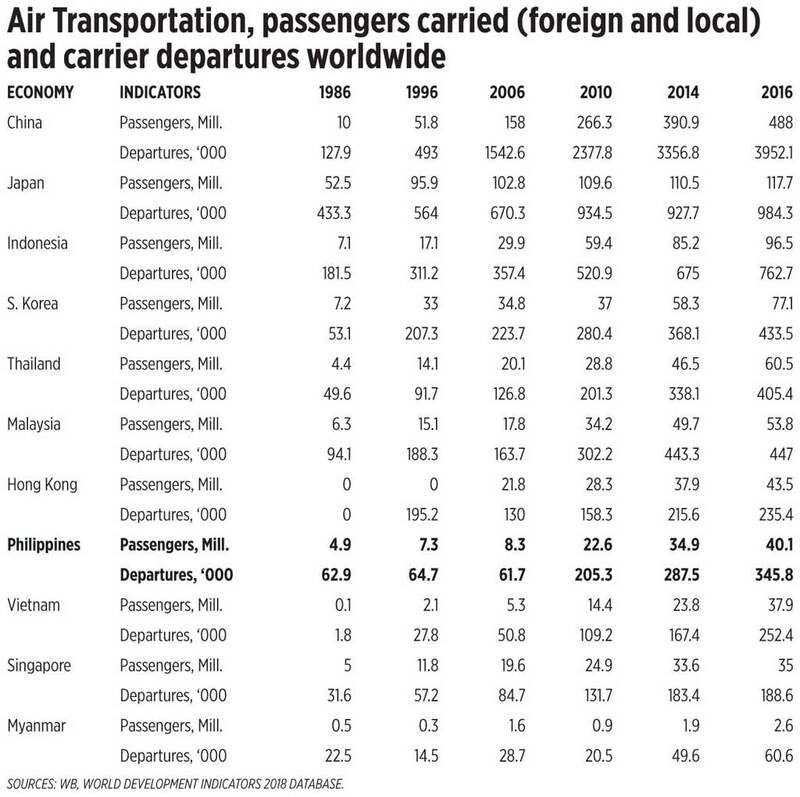 Several neighbors with smaller populations than us — Hong Kong, Malaysia, Thailand, S. Korea — have more air passengers than the Philippines (see table). Note that of the Philippines’ 40 million passengers in 2016, only six million were international visitors (corresponding to 6 million foreign arrivals,) so some 34 million or 85% were domestic passengers. We need to further liberalize airline competition in the country. We also need to expand physical infrastructures like bigger and more provincial airports, have more budget terminals, more toll roads that link the airports to big city centers and major tourist destinations. These will have a combined effect of attracting more local and foreign fliers, and of hastening commerce, tourism, investments, job creation, business expansion and economic growth in the country. Until the last full year of Gloria Arroyo in 2009, PH's debt/GDP ratio was 54.8%. Then came the Benigno Aquino admin, the ratio kept falling with numerator (borrowings) controlled while the denominator (GDP) kept expanding, only 42.1% by 2016. Then Duterte admin, the decline in ratio has stopped. If the trend under the Aquino admin continued, we should only have about 39%, not 42% under Duterte. Dutertenomics lousily takes credit for the low debt/GDP ratio when it was the previous administration that worked hard to reduce the ratio. The purpose of Dutertenomics is to reverse the gains and momentum of the previous govt, via shameless over-borrowings even if there is no economic turmoil/crisis. #fiscalirresponsibility #spendspendspend #taxtaxtax #borrowborrowborrow #Dutertenomics. * This is my article in BusinessWorld yesterday, March 25, 2019. Continuing the Market-Oriented Reforms for Efficiency (MORE) series in this column, we look at one of the important indicators of an economy’s attractiveness to private business, entrepreneurship and job creation, the stock market. Unlike foreign direct investments (FDI) which are long-term and, hence, require lots of basic soft and hard infrastructure, portfolio and stocks investments are often short-term, with investors buying today and selling after a month, or a week, or within hours. Thus, the stock market reflects the long- and short-term business sentiments. The Philippines stock market has experienced good expansion in the previous decade, and further expanded until 2015. It has tanked though at the end of 2016 during the Duterte administration, grew in 2017, but declined again early this year. 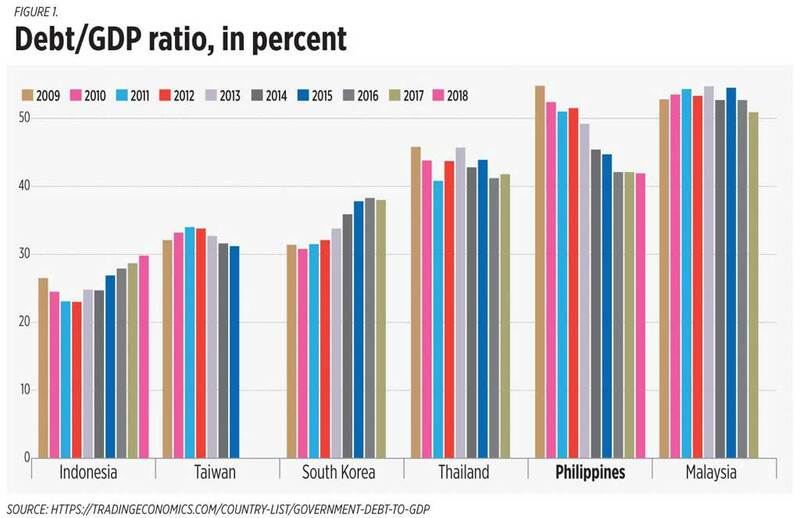 Thailand and Indonesia have started at similar levels with the Philippines in 2000 and, since then, have expanded much faster and are twice that of the Philippines today. Vietnam started late but has shown consistent increases. 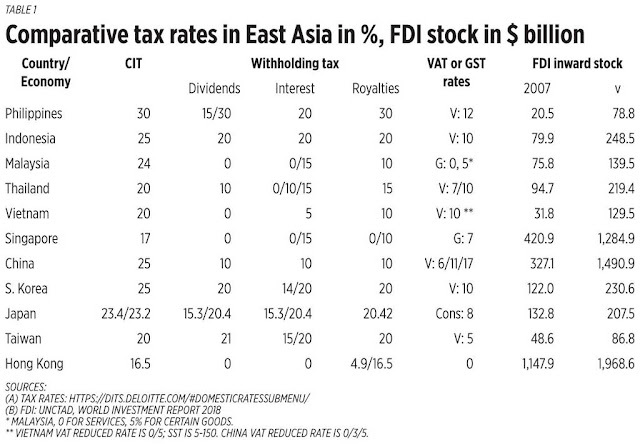 One reason for this is that the Philippines has a small number of listed companies, only 267 (see table). Taiwan is not included in the WB report but it is listed in the WFE, it has market capitalization of $1,118.3 B in February 2019 from 1,716 listed companies. China is wobbling from the ongoing trade dispute with the US and many domestic problems are surfacing today, like huge debts by the corporate sector, state-owned enterprises and local governments. The Philippines needs to attract more companies to be publicly listed. This will invite more individual and corporate investors and help expand market capitalization. I am not aware of the major reasons why there is low participation by corporations in the local stock market. Could it be the huge minimum capitalization required, big and voluminous SEC requirements, BIR alert of more taxes if companies are listed? Or cultural, companies would rather remain “low key” to preserve their clan-dominated corporate structure and investment? Hope that such hurdles will be addressed soon. In particular, the DOF-BIR should not be too tax-hungry that they can scare many companies to be more publicly transparent. There are two forums on the stock market this week. First is the “BusinessWorld Stockmarket Roundtable 2019” on March 25 at Conrad Hotel. The four speakers are Roel Arco Refran, COO of the Philippine Stock Exchange, Michael “Mike” Gerard Enriquez, Chief Investment Officer of Sunlife Financial, Justino “Jun” Calaycay, Jr., Head of Research and Engagement Department of Philstocks Financial, and Marvin Fausto, Business Development Consultant of COL Financial. Second event is the “Breakfast and Market Update” at the PSE on March 29, exclusive for members of the UP School of Economics Alumni Association. It is co-organized by Hans Sicat, former PSE president and a school alumni. Last year, the “BusinessWorld Stockmarket Roundtable 2018” was held in February at Makati Shangrila Hotel. The four speakers were Augusto “Gus” Cosio Jr. of First Metro Asset Management, April Lynn Tan of COL Financial Group, Jun Calaycay, Jr. of Philstocks, and Mike Gerard Enriquez of Sunlife. 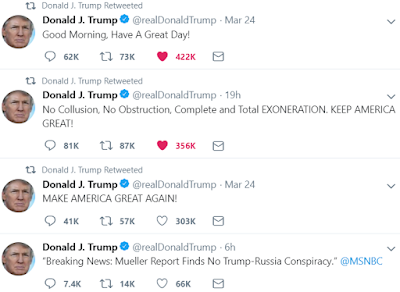 Sound of silence from people who for nearly 3 years were posting regularly of "Trump as Putin puppet". Spreading lies is wrong if it affects them but is correct and fine if it fits their personal biases and dogma. Some reports here. The illustrations I got from the web. 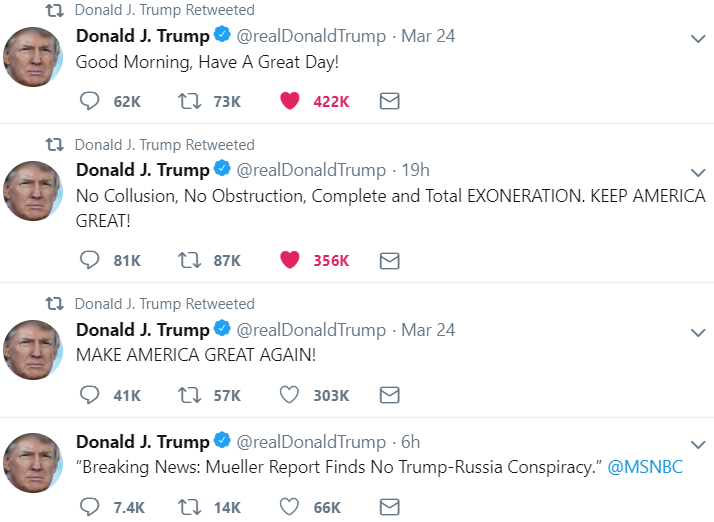 Meanwhile, Trump's recent tweets are getting 300k+, 400k+ likes. Meanwhile, where are HRC and Obama? 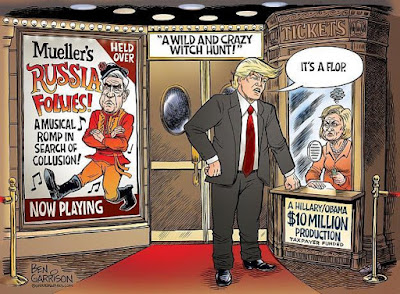 Will they and their friends invent a new hoax, like Trump-Timbuktu or Congo collusion? * This is my column in BusinessWorld last March 22, 2019. Continuing the Market-Oriented Reforms for Efficiency (MORE) series in this column, we tackle the importance of more electricity production in the development of Asia-Pacific economies. On Tuesday, March 19, I attended the joint press conference of the Department of Energy (DoE), the National Power Corporation (Napocor), National Transmission Corporation (Transco), National Grid Corporation of the Philippines (NGCP), and Manila Electric Co. (Meralco) in formally announcing the Philippines hosting of two big international energy events. First, the Association of the Electricity Supply Industry of East Asia and Western Pacific (AESIEAP) in September 2019 in Shangrila Mactan, Cebu; second, the Conference of Electric Power Supply Industry (CEPSI) at the Philippine International Convention Center (PICC) in November 2020. During the open forum, I commented that the Philippines holding these two big energy events that are technology-neutral on energy sources is important, to contrast with the renewable energy (RE) favoritism of the Asian Development Bank’s Asia Clean Energy Forum (ACEF). 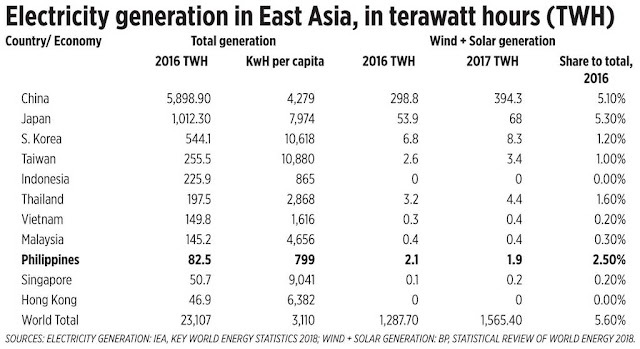 The latter is an annual event glamorizing the role of wind-solar and other renewables while implicitly demonizing the role of fossil fuels in energy development in Asia. Their delegates, speakers, and sponsors fly from all over the world on fossil fuel then directly or indirectly lambast fossil fuel and talk of a “decarbonized world” via RE favoritism and cronyism. Having a technology-neutral energy policy is important for fast economic growth and expansion of Asian economies. 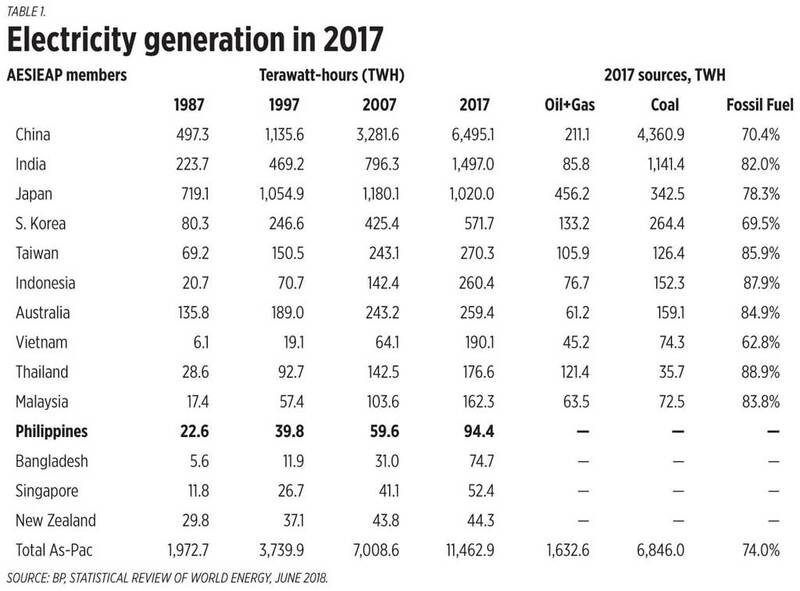 For instance, despite the decades-long lobby to glamorize and subsidize wind-solar and other renewables, fossil fuels provided 74% of total electricity generation in Asia-Pacific in 2017, with many countries being more than 80% fossil fuels-dependent — India, Australia, Indonesia, Malaysia, Thailand, Taiwan, etc. (see table 1). Other AESIEAP members with low electricity generation are Cambodia, Laos, Macau, Nepal, Papua New Guinea, and Sri Lanka. Hong Kong is also a member; its reported domestic electricity production is small because mainland China supplies the rest. High power generation coincides or correlates with high economic expansion. The numbers are shown below spanning 30 years from 1987 to 2017. High correlation is shown in some countries like S. Korea, Indonesia, Malaysia, India, Taiwan, Thailand, and Bangladesh (see table 2). 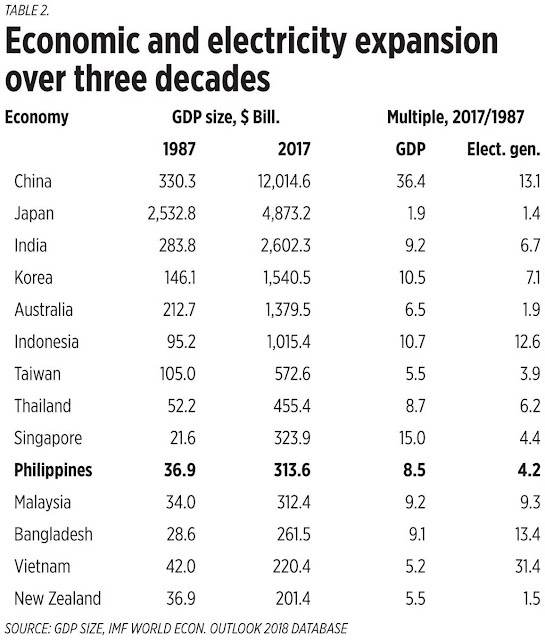 As shown in table 1, the Philippines still has small power generation despite its huge population of 108 million (two times that of S. Korea, four times that of Australia). We need more investments in the sector — in generation, transmission, distribution, and supply. Energy efficiency as “substitute” for more power generation is not enough. If one will drive at night in many provinces, one will notice that national and provincial roads are dark and conducive to accidents, except in some city centers. In many instances, government taxes, permits and bureaucracies, plus occasional price control (like the Wholesale Electricity Spot Market price cap), are among the hindrances to more energy development. Government should learn to step back on these. See these stories below. Go Trump, Pompeo, Shanahan. Just enforce existing international rule of law on freedom of navigation and territorial sovereignty of countries in the region. * This is my article in BusinessWorld last March 19, 2019.